While stage is all set for the launch of Mega hero Varun Tej, son of Naga Babu, the latest we hear is that Naga Babu is busy preparing his son under rigorous training. What’s more? He has put in his son under none other than his younger brother and power star Pawan Kalyan. Although, this has been kept under wraps for a while, it’s out now. 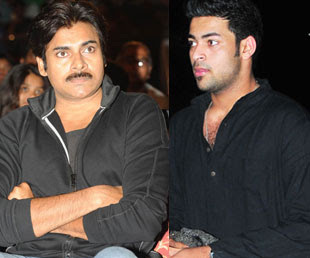 Also, Pawan is keen in training Varun and also mentoring him in choosing projects. Since fights are Pawan’s forte, it is buzzed that Pawan has asked Varun to concentrate much on stunts and action. Varun was likely to make his debut with Puri Jagannadh. But after considering the news of rift between Pawan and Puri which was all out in open, Naga Babu stepped in and dropped the project with Puri for the sake of his brother. It’s buzzed that Pawan was behind shelving this project and suggested Krish’s name. Varun’s debut film with Krish is being produced by Ashwini Dutt and the movie is expected to hit floors soon. As Pawan is known for his super stardom, hard work nature, punctuality and discipline, Naga Babu is hoping that Varun Tej will follow the suit. So, it’s clear that the debut of Varun is nothing but debut of Pawan’s successor carrying forward his legacy.While stage is all set for the launch of Mega hero Varun Tej, son of Naga Babu, the latest we hear is that Naga Babu is busy preparing his son under rigorous training. What’s more? He has put in his son under none other than his younger brother and power star Pawan Kalyan. Varun was likely to make his debut with Puri Jagannadh. But after considering the news of rift between Pawan and Puri which was all out in open, Naga Babu stepped in and dropped the project with Puri for the sake of his brother. It’s buzzed that Pawan was behind shelving this project and suggested Krish’s name. Varun’s debut film with Krish is being produced by Ashwini Dutt and the movie is expected to hit floors soon. As Pawan is known for his super stardom, hard work nature, punctuality and discipline, Naga Babu is hoping that Varun Tej will follow the suit. So, it’s clear that the debut of Varun is nothing but debut of Pawan’s successor carrying forward his legacy.